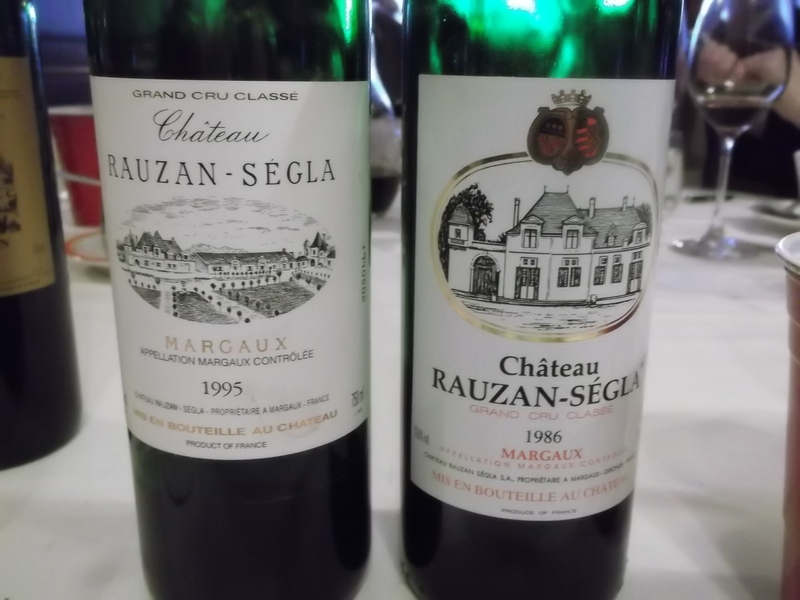 At its traditional January Bordeaux lunch last week, the Wine Media Guild (WMG) of New York sampled multiple vintages from two estimable Margaux chateaux, Chateau Rauzan-Ségla and Chateau d’Issan, (second and third growths, respectively, in the 1855 Bordeaux Classification). The lunch, organized by WMG member Mark Golodetz, stimulated discussion on Bordeaux’s (threatened) status as the wine world’s premier benchmark, while making a great case for the region through the exceptional quality of the assembled wines. The chateaux share an appellation, of course, but the personalities and taste profiles of two houses are clearly and consistently distinct. Comparing the two houses to classical instruments, d’Issan would be the violin — bright, energetic and melodious, with a linear complexity; Rauzan-Ségla would be the cello, an instrument of depth and layers, of harmonic richness and slower reveal. But both are classically Bordeaux and Margaux, elegant and structured, with notes of Cassis, roast coffee, graphite, spice and earth. A respectable 2001 vintage in Bordeaux was pretty much eclipsed by the blockbuster 2000 vintage, making 2001 a good value generally. 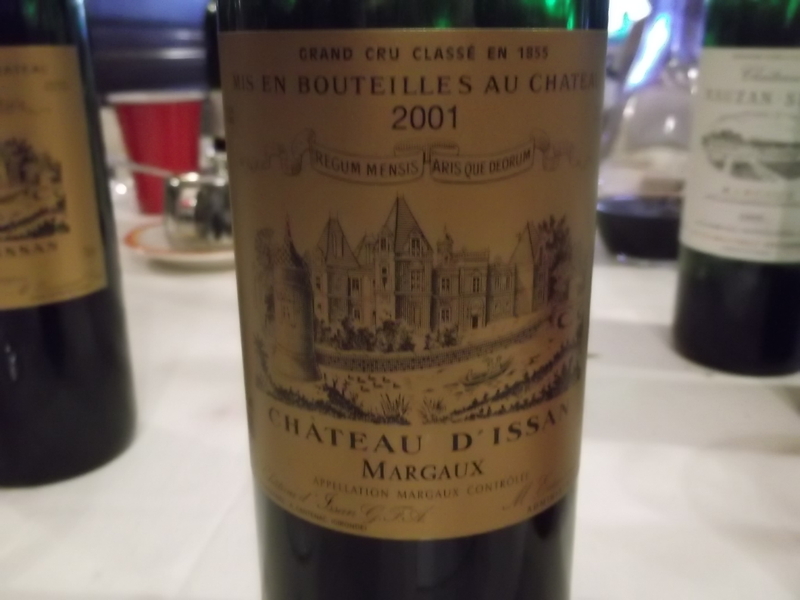 Our small sample from Margaux confirmed this: both houses’ 2001 showed well. In fact, the 2001 Rauzan-Ségla was one of my favorites from the walk-around tasting preceding the lunch, full of complex coffee roast and forest floor aromas, followed by a silky, balanced palate, laced with concentrated black fruit. Similarly, 2004 is another undervalued Bordeaux vintage, overshadowed by the heralded 2005. And the 2004 d’Issan is a winner: an almost opaque dark ruby, this 60-40 Cabernet-Merlot blend exhibits an earthy, classic Cassis fruit nose, beautiful balance and a long finish, with notes of currant jam. Elegant and delicious. And 2003, that year of hellish heat and record early harvests in Bordeaux, has become a lightning rod (or punching bag?) among cognoscenti — a “California vintage” in extreme. Still, some compelling wines were made. The 2003 Rauzan-Ségla is a case in point: big but balanced, with a complex nose, generous, brambly fruit and good acid and length. An excellent effort, which could still benefit from more time in the cellar. At lunch, the two proprietors, Emmanuel Cruse of d’Issan and John Kolasa of Rauzan-Ségla, spoke and took questions from WMG members, who savored over lunch d’Issan’s 2001, 1999 and 1995 (from magnum), and Rauzan-Ségla’s 1999 (from magnum), 1995 and (outstanding) 1986. When asked about the seamless integration of oak across all the wines at the lunch, compared with usually over-oaked wines of similar price-point from California, Cruse noted that d’Issan uses 55% new oak (of various types), with medium toast, but that they “respect the aim of balance and elegance” in their wines. Kolasa went further, saying that their use of new oak barrels depends on what they get from the vintage. With higher alcohol levels, for example, one has to be careful using new oak barrels, because alcohol acts as a solvent on the oak — the higher the alcohol, the more oak extraction in the wine. That’s California’s situation in a nutshell, where high alcohol wines often spend time in new oak barrels. While top flight Bordeaux from the best vintages still dominate the fine wine market, buoyed by growing demand from Asia, there are clouds on the horizon for Place Bordeaux. Especially in North America, where Bordeaux isn’t necessarily a touchstone for a younger generation of wine drinkers, and where there is blow-back on Bordeaux pricing in a down economy. Kolasa acknowledged these challenges, saying that the annual En Primeur barrel tastings in Bordeaux have too much influence on the market, and that the not-so-great 2011 vintage — following the two excellent 2009 and 2010 — will eventually reflect prices from the lesser 2008 vintage. Bordeaux is also not standing still: Cruse mentioned industry support of Bordeaux tasting clubs at prestigious universities across the globe, along with an international tasting competition among the clubs that culminates in a final at Chateau Lafite-Rothschild. Kolasa emphasized the continual sharing of great Bordeaux, like at our WMG lunch, to illustrate and reinforce the quality of the wines. Ultimately, though, “we have to keep our identity as a source of age-worthy wines, and we have to understand what comes from our vineyards,” he said. Both d’Issan and Rauzan-Ségla are doing this, par excellence, serving as effective ambassadors for the world’s premier wine region, one that is not resting on its laurels. This entry was posted in NYC Events, Wine and tagged Bordeaux, Chateau d'Issan, Chateau Rauzan-Segla, Emmanuel Cruse, John Kolasa, Margaux, Wine Media Guild. Bookmark the permalink.